Kate DiCamillo Appreciation: Because of Winn-Dixie - fairy skeletons. 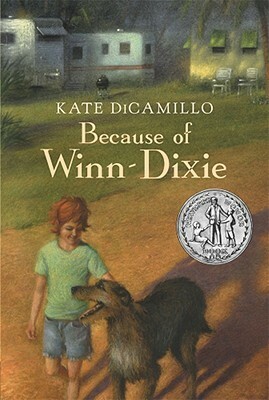 posted by Christina on 12/05/2014 2 comments appreciation because of winn-dixie books kate dicamillo nostalgia! On the corner of the Internet that I frequent, it's pretty widely agreed that extended fangirl sessions on Twitter are always good. So when I found myself in the middle of one with Topaz, Alyssa, Taylor, and AnQi (I feel like there's a really awesome acronym in there somewhere), I was naturally excited. @sisterofsilence @anqiwrites *peeks at conversation* *crashes in* DID SOMEONE SAY DESPEREAUX?! @topazwinters @anqiwrites @sisterofsilence @clocksandcages HUZZAH FOR KATE DICAMILLO! "And for the second time that day, the mouse fainted." But sometimes those fangirl sessions lead to greater things. Hence the birth of this collaborative blog chain/post series/thing where each of us talks about a Kate DiCamillo book and what it means to us. *gasps in horror* You mean it's possible to not be in the know about Kate DiCamillo? I shall set about remedying this. Kate DiCamillo is the author of The Magician's Elephant, a New York Times bestseller; The Tale of Despereaux, which was awarded the Newbery Medal; Because of Winn-Dixie, a Newbery Honor book; and six books starring Mercy Watson, including the Theodor Seuss Geisel Honor Book Mercy Watson Goes for a Ride. She lives in Minneapolis. This doesn't even begin to encapsulate her magical writer powers. Out of her several books, I've read The Tale of Despereaux (most heroic mouse you'll ever meet, plus some soup and a castle and just ahhh), The Miraculous Journey of Edward Tulane (I cry forever because who knew china rabbits could break your heart), Because of Winn-Dixie (which I... shall elaborate on), and The Magician's Elephant (with a title like that, how can a book go wrong?). I've obviously loved all of them. Although she's written incredibly different stories with different, wonderfully flawed characters in each one, I feel like a common motif linking all of these books is that of unlikely friendships. DiCamillo is a master of powerful coincidences - the magic that can arise from chance meetings and the powerful ripple effect that people can have on each others' lives without knowing it. Basically Kate DiCamillo's books were a huge part of my childhood (I'm technically still living through my childhood? but I'll call myself an 'adolescent' so I can refer to my childhood in this way), and they're sure to appeal to readers of all ages and backgrounds. If you haven't read anything of hers, you should get on that and then roll around in your overwhelming EMOTIONS. because of winn-dixie: so... what is this? The summer Opal and her father, the preacher, move to Naomi, Florida, Opal goes into the Winn-Dixie supermarket--and comes out with a dog. A big, ugly, suffering dog with a sterling sense of humor. A dog she dubs Winn-Dixie. Because of Winn-Dixie, the preacher tells Opal ten things about her absent mother, one for each year Opal has been alive. Winn-Dixie is better at making friends than anyone Opal has ever known, and together they meet the local librarian, Miss Franny Block, who once fought off a bear with a copy of WAR AND PEACE. They meet Gloria Dump, who is nearly blind but sees with her heart, and Otis, an ex-con who sets the animals in his pet shop loose after hours, then lulls them with his guitar.Opal spends all that sweet summer collecting stories about her new friends and thinking about her mother. But because of Winn-Dixie or perhaps because she has grown, Opal learns to let go, just a little, and that friendship—and forgiveness—can sneak up on you like a sudden summer storm. That is exactly as awesome as it sounds. It's one of the most bittersweet books you'll ever read, and I definitely consider it a middle grade classic. Opal's voice comes through like sunshine through storm clouds, and it's so uplifting to read. I had to think long and hard about this portion of the post. (Mainly because I read this book so long ago, but. BUT.) Because of Winn-Dixie is a book that is surprisingly multifaceted despite the audience that it was written for, and everyone can take something out of it. Is this not one of the best first sentences you've ever read? Kate DiCamillo immediately plants us in Opal's head with a seriously truth-is-stranger-than-fiction kind of beginning. I learned so many little lessons about first lines from Because of Winn-Dixie - truly something that taught by example. So, a shoutout to that, because it helped me grow as a writer. But on to the deep stuff. I think what really hit home for me with this book is the idea that love and loss are two faces of the same coin. There's no happiness without sadness, and that's what makes living the adventure that it is. Besides, if we were happy all the time, we wouldn't even really be aware that what we were feeling was happiness. To pull out a cliché - you can't see the rainbow without dealing with the rain. It's the bad bits that help us appreciate the good ones. ... I lay there and I thought about how life was like a Littmus Lozenge, how the sweet and the sad were all mixed up together and how hard it was to separate them out. That holds true in so many aspects of my life, and sometimes it's the only thing that keeps me from giving up on whatever's troubling me on a particular day. 2014 in particular has been an especially trying yet joyful year, and I come back to this idea all the time. It helps ground me, and I've learned it well. Because of Winn-Dixie stuck that notion in my head, and for that I'm deeply indebted to Kate DiCamillo. Especially wonderful is how this simple principle can help bring people together and give them hope after a lifetime's worth of sorrow. Opal comes into contact with a widely varying, quirky cast of characters throughout the book, and this helps her reconcile both their conflicting emotions and her own. It lets everyone get closer to their true selves, and that's just plain beautiful. In fact, one of Because of Winn-Dixie's greatest strengths is that it notices people - universal traits and individual traits and all. It takes its own themes and lets its characters grow inside them. From Gloria Dump to Otis the pet-shop worker, anyone can bounce back. Anyone can learn. And that's the importance that this book holds in my eyes. It's a lesson that will always need to be taught as long as humans walk the earth, and reading this book is an amazing way to learn it. 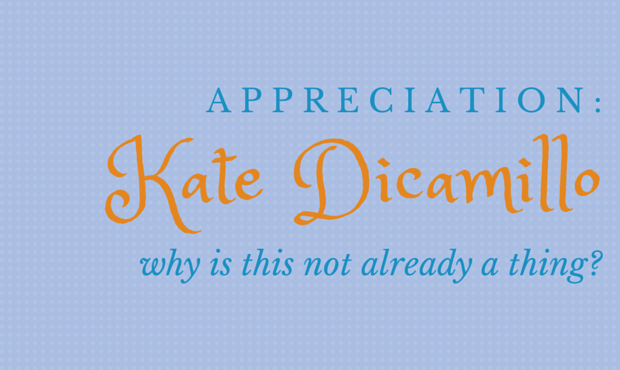 Do you love Kate DiCamillo as much as I do? What about Winn-Dixie? What do you think of this appreciation post? What a fantastic post, Christina! I agree with you on much of this, especially your discussion of what this book means to you. I think one of the best things about Kate DiCamillo's work, besides the quirky characters and multifaceted stories, is the way she touches on so many important and timeless themes--like love and loss, as you point out in this post, and redemption, and the like. And she does it in such a simple and honest way that in a relatively small bundle of pages she gets right to the heart of the matter. This is a wonderful appreciation post--great job with it! Oh gosh, this is such a gorgeous post and now I feel like running away and rereading Winn-Dixie yet again. I can't agree more on the multifaceted aspect of DiCamillo's work. I don't think any of us can even begin to fathom how much thought she puts into not only inserting her trademark wry humour and soft wisdom, but also twisting the timeless themes in her books into a format that's digestible for younger kids. It's incredible and she does't get enough appreciation for it. Side note: SHE LIVES IN MINNEAPOLIS?! I AM FROM MINNEAPOLIS.